The lighting system is somewhat disappointing. The Shutter Precision SD-8 hub dynamo is designed for small wheels with high rotational speed, and is small, light, and efficient. The Supernova E3 Pure 3 gives good light but doesn't have an off switch. The power drain from always riding with lights on is small, and there are safety benefits even in full daylight, but the rider should make that choice. I could make my own light switch solution, but it's hard to get that properly sealed against water. I may replace the E3 with something better, perhaps the Busch + Müller IQ-XS. Secondly, the way it's mounted it shines on the front carrier, leaving a shadow on the road ahead. It may be hard to find a better spot for it that doesn't leave it vulnerable when the bike is folded, but I'll have to try. Third, it throws no light straight to the sides, for being seen in that direction. It's got good looks but poor functionality. 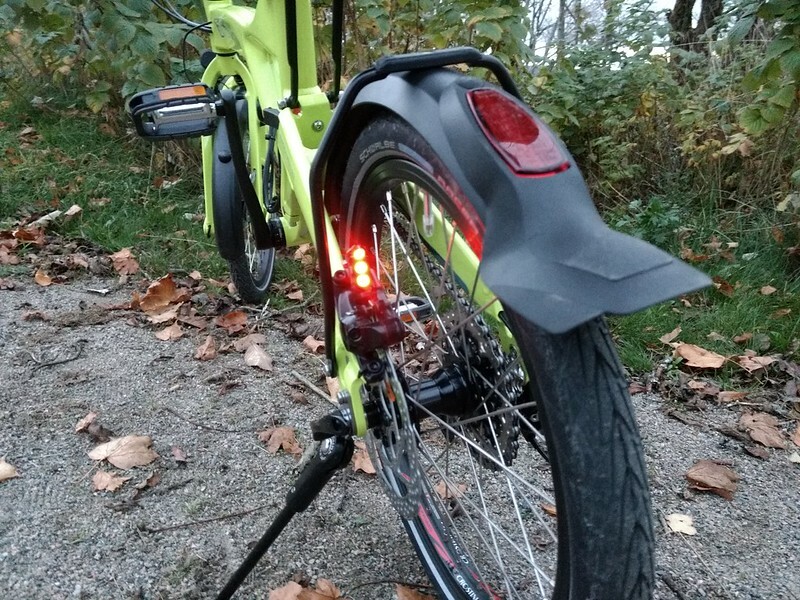 The Supernova E3 taillight is bright but tiny, and mounted on the brake caliper where it is easily obscured by the wheel. 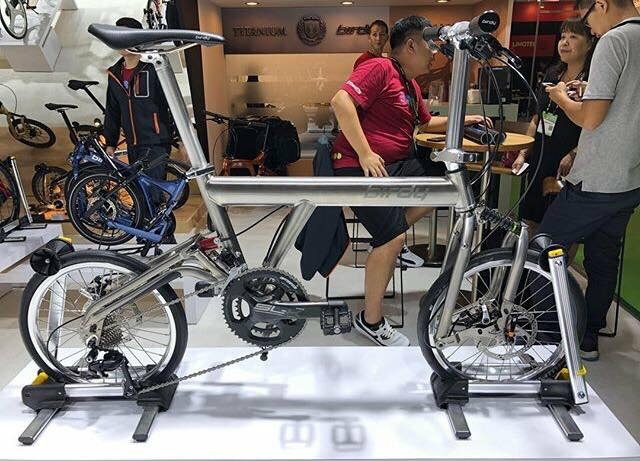 It's completely unnecessary to use such a quirky minimalist solution when the bike has a rack with a standard light mount and a big flat reflector on it. I'll probably put a decent sized taillight/reflector combination there instead. Still, no regrets. The important thing was to have the dynamo wheel in place, lights are easy to swap out. I just wish R&M would have more focus on functionality here and less on stylish looks and minimal weight. Gearing: It's got the regular 52t chainring. Rear it's got an XT derailer, and a special Sunrace hub & cassette combination that isn't compatible with anything else. The cassette is a 9-32t and 10-speed, and is used instead of Shimano's discontinued Capreo system. It shifts well enough, seems accurately adjusted. The tiny 9t cog means you get lots of high end gearing with a normal chainring, despite the small wheels. The 356% range goes from 2,1 to 7,4 gain ratio, a bit low range and high gearing for a touring bike, I'd say. Something like a 42t chainring would make more sense if touring someplace not flat. A dualdrive setup would give all the high and low end I could wish for. An Alfine 11 with 409% range might also be enough. I wish they'd sold it like that. The Nexus 8 they do offer just isn't enough, with it's 306% range. 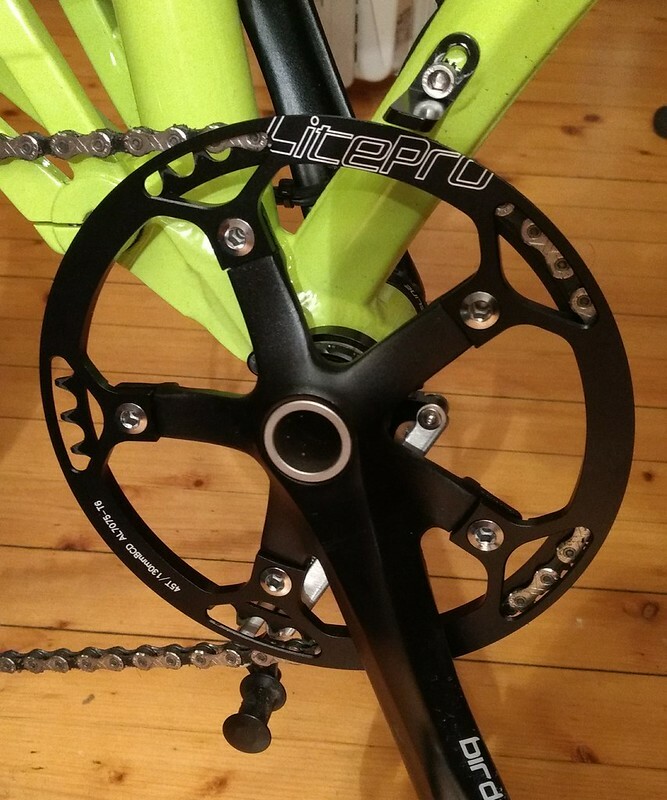 I've ordered a Litepro 45t chainring, which will move the whole gearing range about 1 gear downwards. Now I've found out that Sunrace also makes an 11-speed 9-36t cassette that fits the same HBSX hub, the "CSSX0 ENW". That gives a 400% range, almost the same as the Alfine 11. And with the 45t chainring I'd end up with 1,6 to 6,5 gain ratio, quite ok for touring. If only I can find some way to buy it (no normals shops have it, afaict) I'll convert the bike to 11-speed. Secondary benefits: I can get a Shadow derailer, which allows a more compact fold since it sticks out less. And I can make it a medium cage, for a bit more ground clearance. But it all hinges on actually getting hold of this cassette. Hey Mike - what kind of contraption you have attached at the back - with the transporting wheels? Is this something available to buy? It's probably a cheap version of the product in the link below. Helps keep the bike stable when folded. Was put on by the previous owner. Back to my chain issues. Got is sorted now. Installed a new 18T rear sprocket. Still not overly happy with the Alfine 8 hub, but that's a battle for another day. I have a good lead on the cassette now. But looking very closely at the folded bike, it seems Shadow will not work out after all. 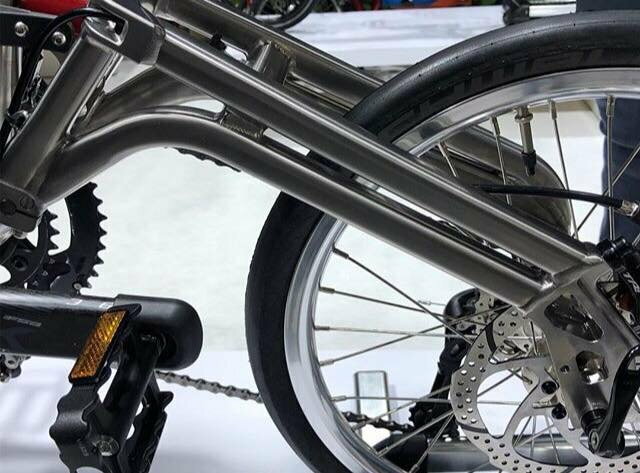 The front wheel QR nut will hit the extra link on Shadow derailers, where it extends backwards from the derailer hanger. I could use a lower profile QR skewer, but it will hit anyway. And non-Shadow 11-speed Shimano MTB derailers don't exist, afaict. It's clear that replacing the derailer requires careful measuring. It looks like SRAM MTB derailers won't work either, they also extend too far backwards from the derailer hanger. Shimano road derailers are also moving towards the Shadow design. Old style derailers are still available, but that doesn't help much since they're designed for road cassettes which have a smaller cog separation than MTB. 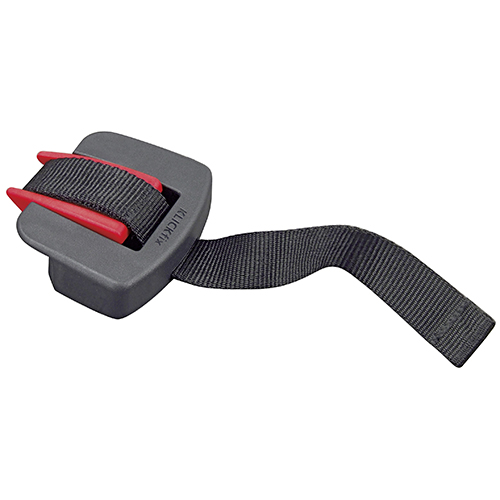 It can perhaps be made to work with a JTek ShiftMate, though I'd avoid that if possible. One alternative is to keep using the stock 10-speed MTB derailer, with an SRAM 11-speed shifter. The cable pull and derailer ratio combination seems close enough that this can work, with a little tuning. Another alternative might be a Sunrace derailer and shifter. Their MX and MS 11-speed derailers look somewhat Shadow-ish, but extend far less backwards from the derailer hanger. Microshift also have derailers that will fit. However it goes, it looks like R & M will have to redesign the Birdy in the near future, since it's folding design requires a derailer design that is rapidly becoming obsolete. It doesn't take much though. They just need to move the front hub 1-2 cm away from the derailer hanger. Or they could go exclusively for IHG, of course. Glad to hear it, Mike. I've been considering the Alfine 11. The Alfine 8 is more solid, according to those who like to "abuse" IHGs. But the gearing range is very limited. 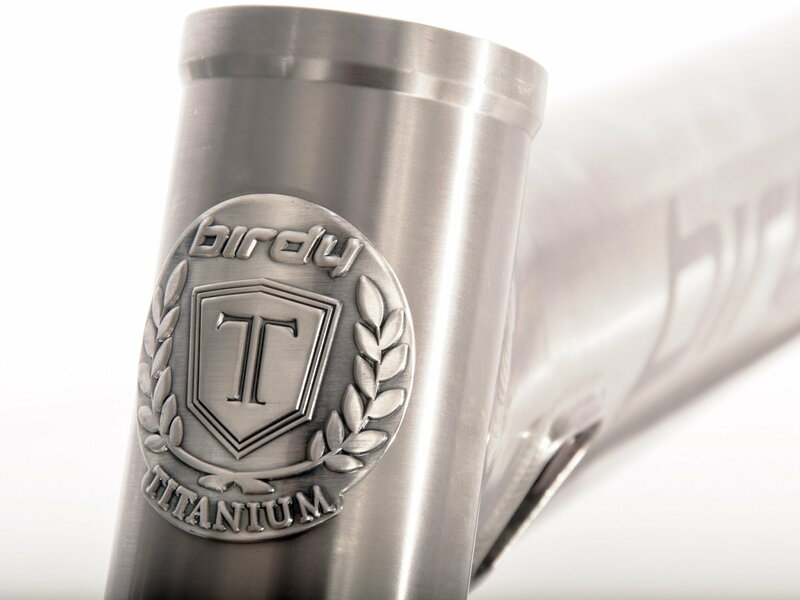 I just came across these photos of the latest Birdy Titanium. Anyone in Asia has any idea about its launch and availability? OMG!!! That bike is SMEXY!!! Wow, that is nice. I like that it is a different design than the last version. Too bad they didn't hydroform the frame like the AL version. Although it will probably be much heavier than the AL version, it should be more durable against dings and scratches so better for travelling. I'm sure it will be quite limited and expensive like the last one too, but you can pass it down to your kids since it will look the same decades from now. Last edited by ttakata73; 11-01-18 at 10:22 AM. Sorted my chain issues. Now my attention turns to the brakes. 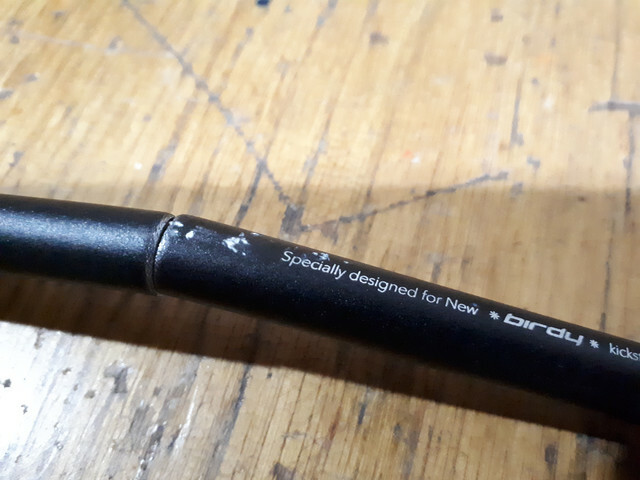 I have bought some Avid SD7 brakes but found that I need to replace my old cable due to wear/damage. How one earth do I install the new cable and sleeve through the front swing arm? I haven't done this on the Birdy yet, but general advice is: Before removing the hold cabling, take careful note of how it's routed. Then, find a way to attach the new cabling to the old (duct tape? ), so that when you pull out the old, the new one gets pulled in. 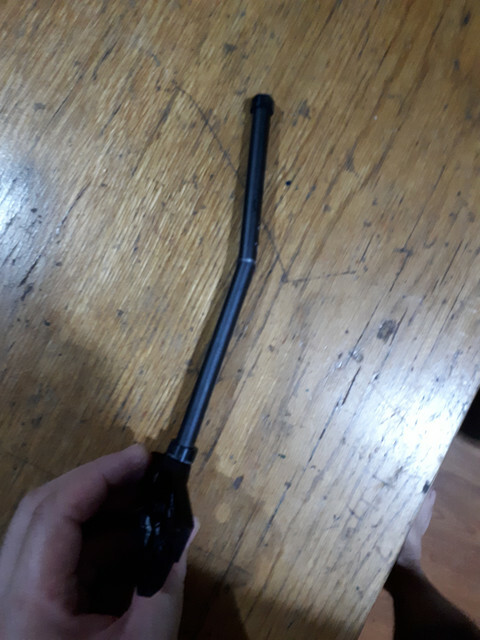 If you manage this, you avoid fishing blindly inside the fork tube for the loose end. If you've already removed the old cabling, it may be easier to poke a wire through the fork first, and use that to pull the housing / sleeve through afterwards. You know what? It was actually a complete non-event. Feel a bit silly asking now, as it took all of 2 mins, with no major hassles or snags. Cheers. Hi, I just bought a used Birdy with a grey aluminium frame. Sadly, the frame is now tarnished. Would have attached some photos but given I’m a newbie to the frame, I’m not allowed to...anyway, appreciate any tips on how to polish and refurbish the aluminium frame please! Thanks. The Supernova E3 Pure 3 gives good light but doesn't have an off switch. The power drain from always riding with lights on is small, and there are safety benefits even in full daylight, but the rider should make that choice. I could make my own light switch solution, but it's hard to get that properly sealed against water. I may replace the E3 with something better, perhaps the Busch + Müller IQ-XS. I added a light switch. Most modern dynamo headlights have a switch, some even have automatic daylight sensing. Most cost less than this switchless E3. Really odd choice by R&M. "People who want a dynamo must want to have the light on all the time." No thank you. That's a tough one if you want to see the raw aluminum. You can polish with metal polish, and then send it out to get a clear powdercoating, that's probably what Birdy did. Or you could send it to get clear anodized. Either way might be expensive. There are many other sources saying you can clear spray aluminum, but from my experience spray paint doesn't want to stick to a smooth surface for long; it just chips/peels off over time. If you want to save money and time just sand it with 600 grit sandpaper, then spray can metal primer, then a color coat. There is a universal Klickfix adapter now too, but it's not in shops yet, and it's 20€ more expensive than the other ones. Second mod: Replace the stock 52t with a LitePro 45t chainring, to shift the gearing range about 1 gear downwards. Also saves 164 grams (not that this matters). The chaincatcher on the downtube had to be flipped around, but still fits nicely. The chainring itself is some distance inboard from the tabs that are bolted to the crank, so I had to add 3 mm chainring spacers to move it back out far enough to keep the chain from rubbing the "chainstay". Will also need to shorten the chain to keep it taut when folded. 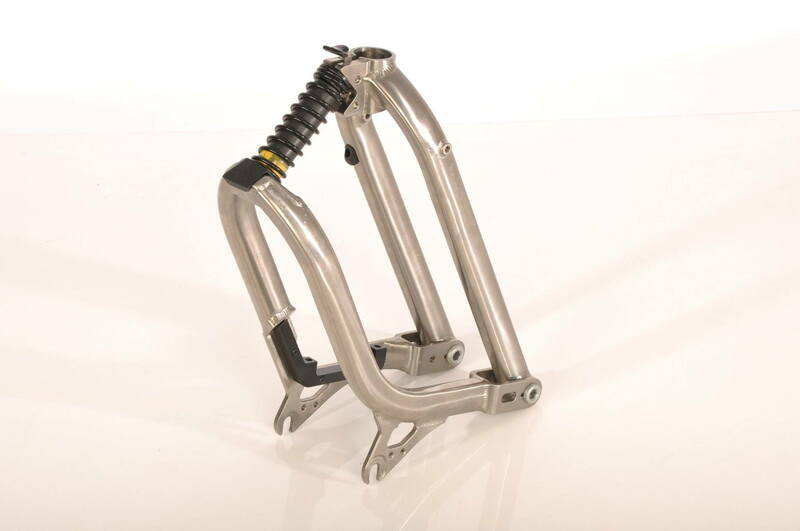 Imperium Cycle Multi-s kickstand is overpriced junk. 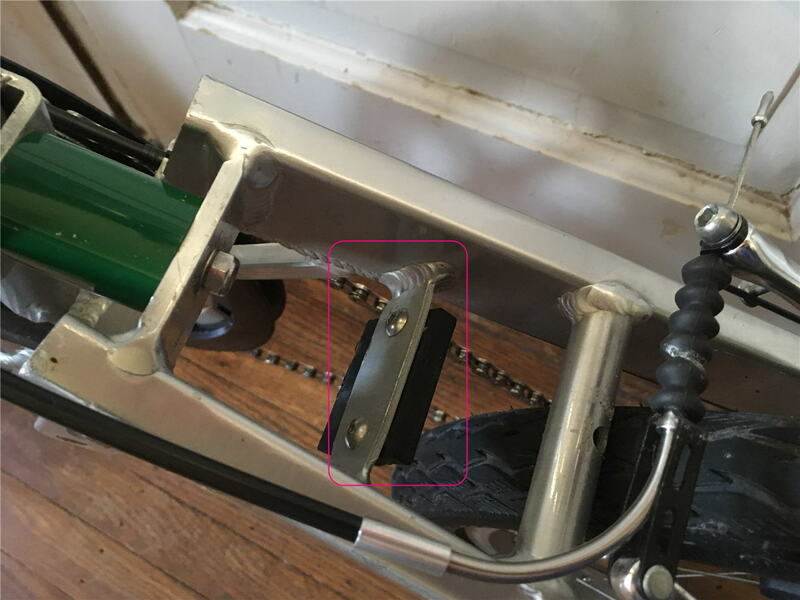 Beware of the Imperium Cycle Multi-s kickstand because it is overpriced junk. Only 100km of riding and my kickstand bent a little. Then in another 50km it bent enough for the bike to fall over on it's own. So I decided to see why the kickstand bent so easily by breaking it open. This is a very amateur and bad design. Only a 10mm tube with 1mm wall thickness is used to support the bike. The strong spring is inside the tube so it is constantly fatiguing this tiny aluminum tube. It is where the spring meets the inner steel insert that the outer AL tube bent. I was lucky the bike didn't fall into the car next to me. According to Daniel, it should be March this year. 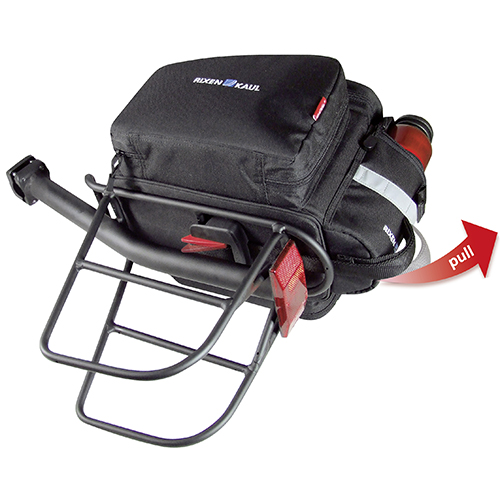 Does anyone here know if the Klickfix Rackpack adapter fits the current Birdy rear rack? This is a simply a claw that grabs a transverse bar on the rack. The only fitting issues are the allowed thickness of the bar, and the width of the adapter, which has to fit between the long bars of the rack. I'd love one of these, but the distributor for Pacific Cycles here in Japan has been very lax in recent years, and as a result, most shops stopped selling Birdies and are focusing on Bromptons. It's a shame, because having both bikes, the Birdy is much better. An odd thing about Japan is that it's a stupid-silly place when it comes to the distribution and retail of some products, and Birdy bikes seem to have come a victim of this nonsense. 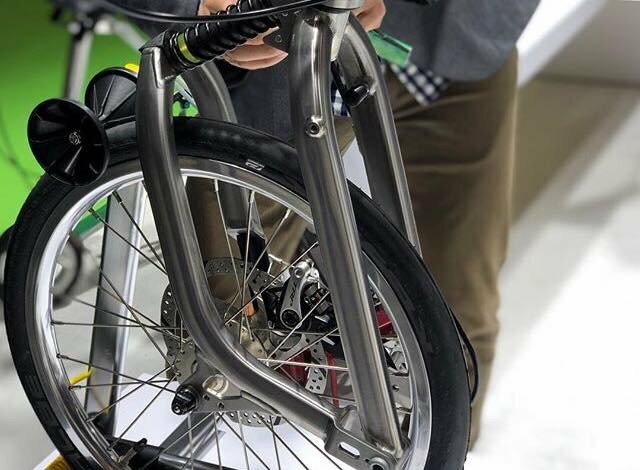 The old Birdy titanium bikes were sold in Japan, but used examples are now selling for about $3500. I suppose I'll have to buy one in Taiwan the next time I visit. What was this piece designed to do on the BD-1? 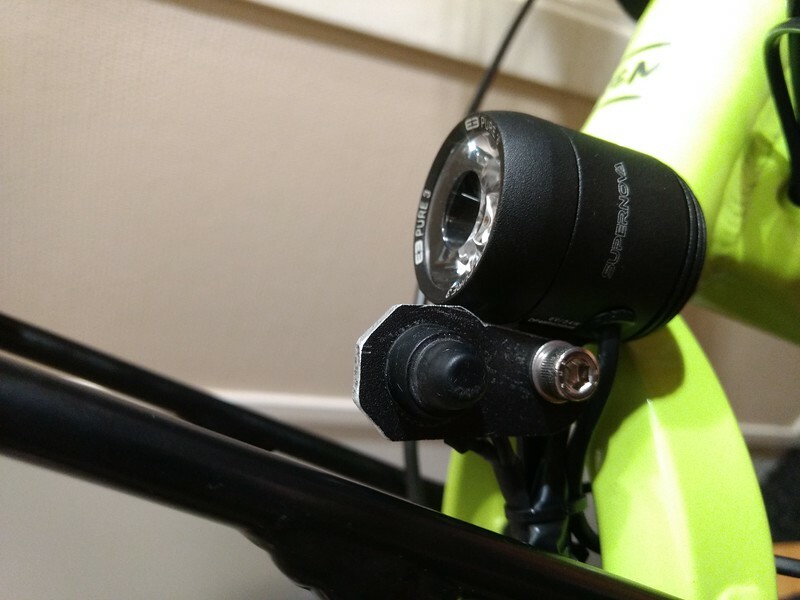 Act as a bumper against the seatpost or bottom bracket when folded? I have similar bits on my new Birdy. Only I'd expect the black bumper material to be facing the other way. Ah. 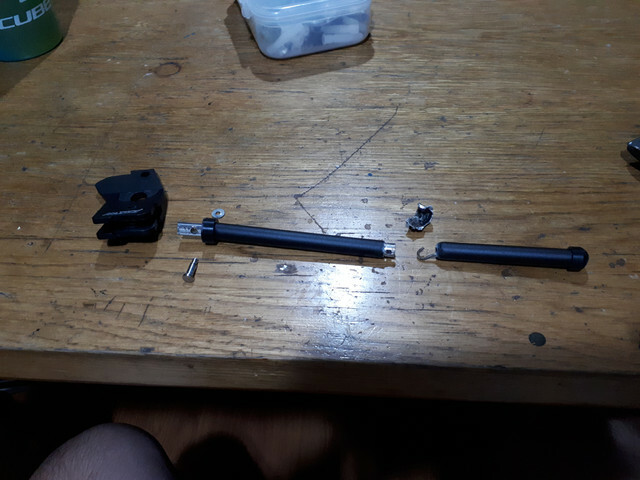 Since my seatpost clears it by 5-6mm in its present configuration (not put that way by me but by the former owner) I thought it might be a place to attach some little roller wheels, though I haven't seen any roller-wheel assembly that would use those bolt-holes in that manner. Last edited by berlinonaut; 01-13-19 at 05:02 AM. 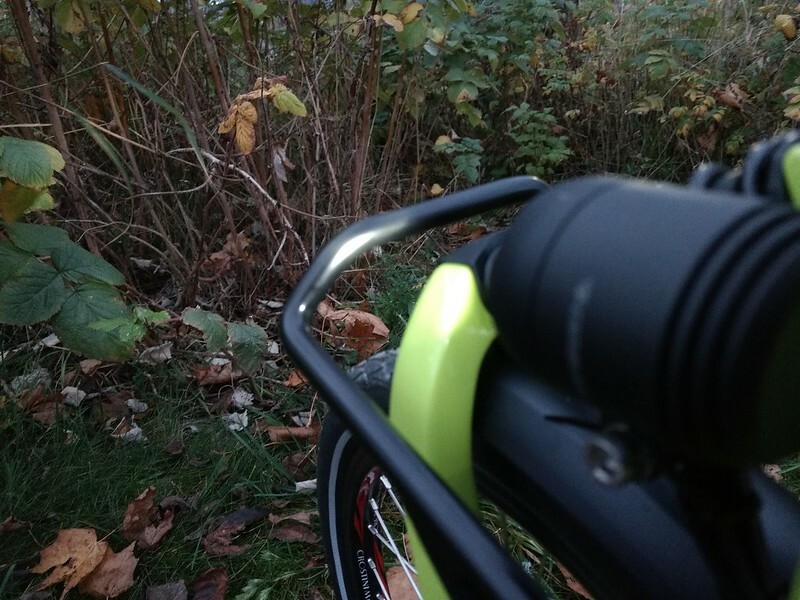 A word of warning/caution to Birdy-riders: A couple of days ago there was another report of a spontaneous break of the rear fork on a Birdy in the German folding bike forum. This is the third report about that in that forum within the last years. Thanks, I'll be sure to look out for it. 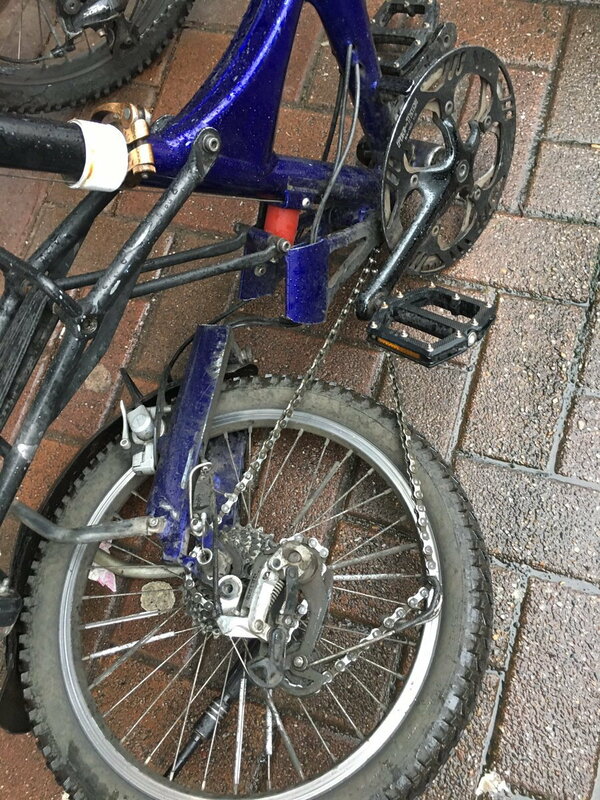 I've had another full suspension bike (old Kettler) break in a similar place. My Birdy from last year seems to have a bit of extra strengthening in this place, though I can't really see from that picture if that bike has the same or not.